Crews are working to repair a water main break located on Niagara Falls Boulevard in Amherst. 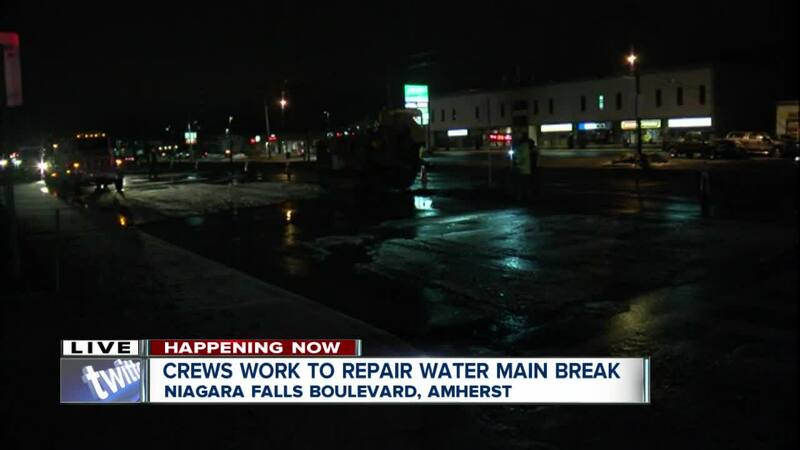 AMHERST, N.Y. (WKBW) — A major water main break has been fully repaired and traffic has been restored to normal on Niagara Falls Boulevard in Amherst. Crews worked all day to repair the water main break located on Niagara Falls Boulevard near Maple Road, according to the Erie County Water Authority. Because of the water main break, north bound traffic on Niagara Falls Boulevard between Sheridan Drive and Maple Road was reduced to one lane for a majority of the day.